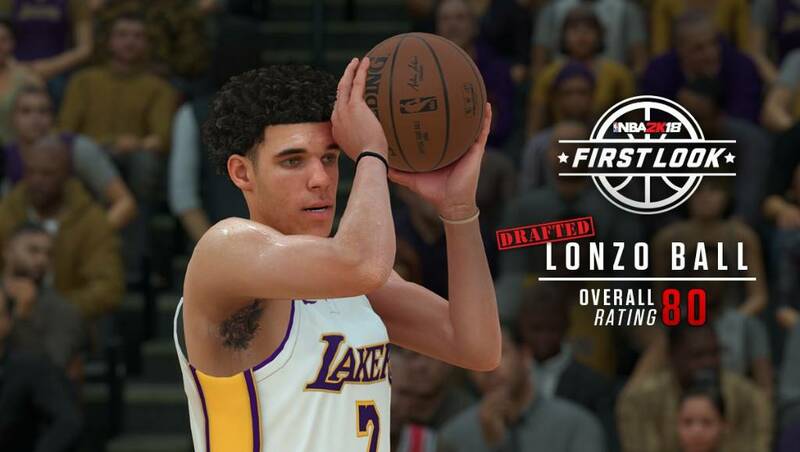 2K has released another NBA 2K18 screenshot, this one featuring Lonzo Ball in his Nike Los Angeles Lakers uniform, along with another look at the #1 pick of the 2017 NBA draft, Markelle Fultz (Overall 80) in his Nike Philadelphia 76ers uniform. Check out the first Markelle Fultz screenshot here, just in case you missed it. All other NBA 2K18 player ratings, that have been released so far, can be seen below. Is he tugging the jersey? The player model looks spot - on but not sure that he's as good as Fultz ratings wise. I like how Lonzo seems as though he's looking at the basket. Things are looking very on point this year. This might be the highest detailed rookie class in 2K history. 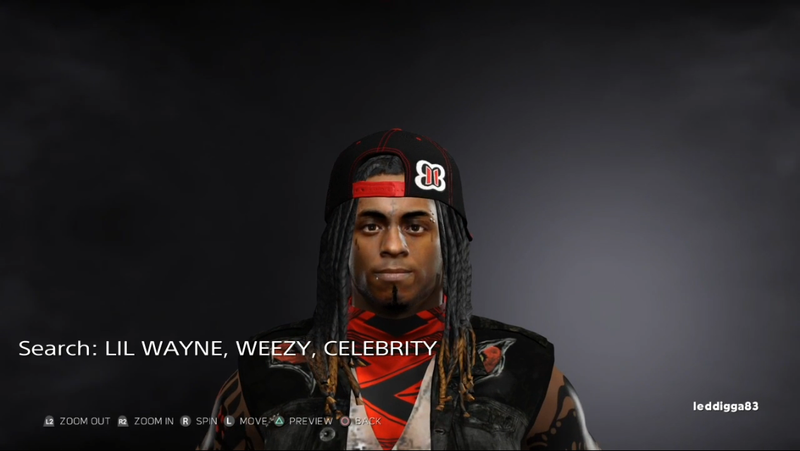 Weird necks are gonna be the theme of this 2k isn't it? Looks to be that way. But I'd rather have slightly longer necks than completely off Body types. Body types seem to be looking a lot better this year imo. I've kept this to myself, but because this picture was posted I'm going to bring it up. I have been quietly hoping that NBA 2K would add some sort of "jostling" system to the game. Similar to what FIFA and PES have done, but obviously more of a "ride the hip" concept. This would allow the developers to get rid of all those canned "stonewall" defensive animations, as well as eliminate the need for all of the sliding/warping/telepathic CPU defenders. Yeah it looks like he's wearing a showering cap. What an amazing scan. I'm talking, borderline photorealistic. Seriously.....necks look fine....last year they looked like koopa troopas from that goat Mario bros movie. Bit off topic but it's Gamescom this month. I look forward to those bad cam vids. Edit: I don't think there's any jostling animation going on in that pic. It just looks like one of many contact layup animations. Player models look so much better which means CAPS will look so much worst in myleague on the court next to them. Is it me or does Markelle have last year's skinny body type? They should get rid of it already. I could live with Lonzo with that body, but Markelle is not skinny at all. SMH. That is IF they haven't changed it. Gotta see if it has been updated before making that statement. Well CAPS usually shared body models with other players. Lonzo and Fultz look like they have the same body model as each other so maybe it's the most common one? Which is usually the one the CAPS have. I love the necks this year ( pause ) and how it doesn't look like its straightly connected to their shoulder ( Esp Jimmy Butler and Kyle Lowry ). 2k gonna mess around and make me buy 2 copies this year. Cool, Lonzo Ball is a greater passer in real life. hopefully they can represent his play as well as they did his likelihood. His full court passes and non floaty passes and all. Another outstanding pic. I think it's safe to say that 2K has put in work with the body types, and I'm not someone who was terribly unhappy with them in the past. I see now, especially with the comparison pics Steve has been dropping. Also loving the rollout this year. Pics aren't much to go on usually, but it's something, and this year in particular they give us a nice glimpse into what's changing. I had a bad feeling about 2K17 from the start and it felt like it just snowballed down a negative trail. 2K18 feels totally different. Almost like they learned something from last year. Anyway, awesom pics and keep them coming until we get to the meat and potatoes. Seems like Fultz got that high school body type in this screenshot but he looked fine in the last screenshot??? both have the same body type in that pic imo. lonzo is just closer with a better angle. Cool...hope they get back to current players. Interested in what has been fixed. Amazing details in this screen shot. You can even see Lavar's bald head in the background sitting courtside. Markelle Foltz does NOT have the hs bodytype. There's a huge difference. If that's the case I suspect these screen shots were taken during different builds of the game. Thankfully the player models are looking on point this year especially after last year's debacle with the noodle arms. If the gameplay received just as much attention then we could be in for a treat. I would still like to see a little more muscle definition though. Hopefully players like Westbrook & Giannis have their ripped tones this year. On the flip side I hope they finally get CP3 right this year & don't have him built like the Hulk. Keep em coming 2K! Are the anorexic models gone the way Of the dodo bird? Bro I gotta say my feeling this year compared to last year this time is a total 360 truthfully I cant remember feeling good about much of anything last year and esp. Not the screenshots they released. Game is looking amazing. Can't believe guys are complaining about necks. Really necks??? Foh. 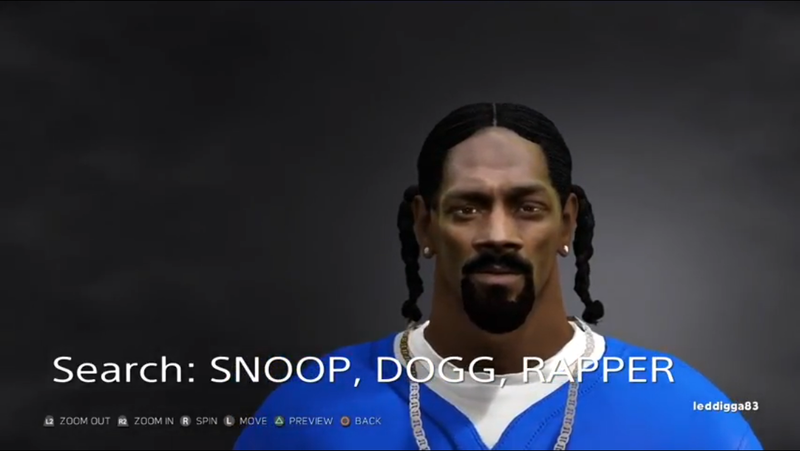 The 2K face scans are amazing! They were tugging and grabing jersey this year. Hopefully they recreated lonzos ugly *** jump shot. Signature shots/dribbles have to be on point to go along with these awesome player models. I always get excited to see the rookies more than the usual people we see. This is great. Another top notch screenshot. Game is looking better and better by the day. The only thing I don't like is them getting rid of the legend-scale for ratings. I really liked that system. "Ok, lets try it again and see if you can avoid dislocating your shoulder this time"
Looks exactly like Lonzo. 2K nailed it this year with the rookies. This is a serious issue. Unless the CAP has had a significant overhaul it's going to be difficult playing My league etc. I'm going to cling onto the hope that these new body types have made it into a more sophisticated CAP system. At the very least, I'm really hoping 2k took the time to re-create all of the facial features/facial expressions for created players. As I stated in the post above, things like the cheeks, eyes, discolorations, eye bags...etc etc, just look super messy/unnatural. Also, the facial expressions are all super ugly and repetitive. On court, they make everyone look like the have big eyes, puffy cheeks, a pointy top lip, & a super huge mouth. Always remember, 2k is one trip down the hall away from being able to deliver CAPs that could easily blend in with scanned players. This is the technology that currently exists within the company. I think Fultz may just be lacking a little beef on the arms.... below is a comparison. Interested in everyone's thoughts. Not too big a deal (not nearly as bad as last year) but the middle pic below seems a little slender. They look amazing tbh and I have no clue why you guys are complaining about ratings. 1. 2K always makes the top rookies around a 78-79. One more attribute ain't gonna kill us. Especially since they're dynamic and will eventually even out to realistic numbers. 2. We don't know how attributes work positionally so comparing them to Nick Young & Dwight Howard makes no sense. I believe Nick Young is a 74 in 2k17 right now, and he's still dangerous in the right person's hands. 3. It's marketing. People want to use the two most hyped rookies in recent history and it makes sense due to the rivalry that they be similarly rated. But back to the picture. This is crazy but it's a double edged sword. The MyLeague news and these screenshots made me preorder this game, but honestly if they don't upgrade the CAPs, I'm gonna cancel it and wait for a sale. Our CAPs already look bad next too the garbage models in 2K17, we'll stand out like Roger Rabbit cartoons next to this level of realism in 2K18. I have high hopes for this game, man. They better not let me down. Great! Waiting more drafts pictures! Looks good but something about the eyes that I don't like. Seems off and not human like. Actually they were consistently in the 74-76 range, Ben Simmons was the first 79. We have to be careful NOT to be prisoners of the moment. IMO its more about consistency. I've got a problem with Fultz' 80 so I definitely have an issue with Ball's 80. There are serious doubts to his game translating and he was NEVER in the conversation for the #1 pick...especially after workouts--many people think he drops to SAC if the Lakers didn't pick him at #2. I get the hype but ratings are supposed to be based in truth/facts/metrics. I just can't envision any scenario where you look at the production of Fultz and Ball and decide those two players are equivalent. But sure, I agree the visuals are outstanding. Man how did some of you guys survive during the PS1 era? Complaining about necks, eyes, and shots not being completely perfect lol. It's funny because I'm from the Original Nintendo era but yet I still find myself nitpicking over the smallest details but as an adult details and realism matters more to me but as a kid I was just happy to be playing this thing called video games. At the beginning of the 2k17 cycle Simmons was rated a 79 & Ingram was a 78. Even Dunn was a 77. Both Ingram & Dunn's ratings dropped as the season progressed because they didn't play very well so Ball & Fultz will have to show they deserve to be rated 80 or they'll drop as well. I have no problem with these ratings. Ball looks spot on!! 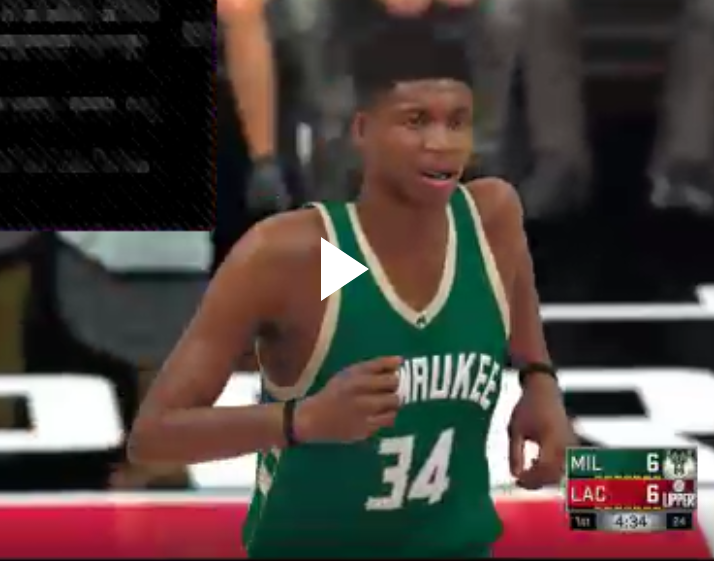 I really like what 2k is doing with the eyes of these players this go around. Look at ratings from 2K12-2K16...you wont see rookies rated 78-79 as any kind of norm. I agree that Stauff fixes ratings when guys don't perform. My issue is Fultz and Ball being equal (and too high IMO) and keep in mind the first roster updates won't be available for awhile...those initial ratings are static for a bit. I agree the rookies look amazing. I think 78-77 has been the norm since 2k15. The 2014 draft was pretty weak if I'm not mistaken. With that said I can certainly see how 80 can seem to high to some. Recent 2k's are so badge heavy though & imagine the rookies won't have many badges. I think 2k17 had Simmons with maybe one or two bronze badges. These are some of the best rookie pics I've ever seen. The eyes, the details and the photorealistic faces are on point. Good stuff. With pinpoint, anticipatory passing and transition basketball being the strength of Lonzo's game, I don't know how well one is going to be able to use him in NBA 2K, unless there have been some fundamental changes in those areas in NBA 2K18. He's going to be close to useless in 2K imo. Unless like you said they made drastic change to the game. I used to say the same thing. I had the same mindset last year when screenshots first came out and people were pointing out various flaws but it's inevitable. As graphics improve more and more people will point out smaller inconsistencies in details. For me I'm just happy to see that things are still improving. The 2k18 screenshots compared to 2k17 are night and day better. Players aren't perfect but no sports game to this point has had perfect visuals and player accuracy. If people have expectations of perfection good luck. On another note I agree with people about CAPs. That mode is long do for an improvement and overhaul. It doesn't make sense that this game has modes centered around created players but the tools given are lack luster. The face scanning app helps but even then they don't give us enough options to take our players to the next level. And if you are trying to create a person, such as a missing player or legend, with the face scanning app good luck. One of the reasons I can never use the great created rosters made by the community is because CAP players just don't look right, despite the tremendous effort put forth by the creators. Wow that might be the best shot yet. His face looks real. At first glance I thought that was a real photo. Lonzo takes the lead for best screenshot released damn 2k gonna make this month go by so slow. 2K11 - John Wall was an 81!!! 2K13 - Anthony Davis was rated 79. 2K14 - Anthony Bennett was a 76! and he's arguably the worst #1 pick ever. Those ratings for the highest rookie in each game average out to 78. It's the standard, and with the game improving and players coming in as hyped as they do now, it only makes sense that we see that number increase. Also as I pointed out, Wall was rated higher than both of these guys. Will LaVar Ball be playable? I see you, 2K. Officially got me on the hype train smh. Photo realistic shot right here. Biggest takeaway from these pics are just how dark they have him. I hope skin tones aren't an issue again this year. Yea I see a similar problem with the Paul George screenshot they seem to have brought back the red tint in skin color from 2k16 too. But I won't complain to much about that. I don't get why ratings get so much play. Like these things don't update week to week to week or anything. If Ball beasts this year, it could go even higher. I get it to a point. People that are playing basically any mode offline don't have the luxury of having these ratings change partway through the season to better replicate how much players have progressed/regressed/failed to meet expectations. I personally don't really care about the ratings as long as the players play realistically though. 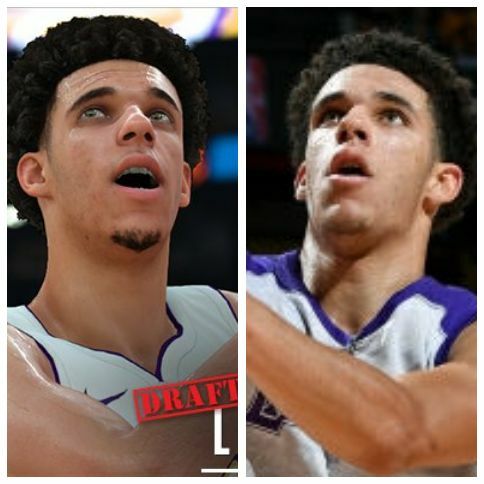 I'm very curious to see how Lonzo plays considering how unique his skills and tendencies are in real life. I don't care one bit about ratings TBH. I play offline and I believe if the defensive schemes are all in the game and functioning properly, there is a strategy to contain almost anyone to a degree. Actually adds to the enjoyment...... (if the schemes are functioning properly). And yes, I had to say that twice. Ratings were running out of control pre-2K12 which is why I didn't mention it...I remember Josh Smith being an 89--which I think we all agree is laughable now. They shrank the ratings and gave us much better accuracy from 2K12-current. BTW, Kyrie started with a 76 in 2K12. Why would numbers increase because its now? I don't think hype should be a valid rationale re: ratings...its about grading guys based on their skills, in comparison to past drafts and the players in the league. Below were the rookie ratings from 2K12 to current. Sans Lebron who should be the rookie ratings standard (and who you'll note was a big, fast, explosive two-way player experts thought had MVP potential) I think most of us would agree AD should have been graded the highest contemporary guy...he was an elite defensive big with guard skills (who shot 62% from the field) and checked virtually all of the boxes--not to mention two way players should always be ranked higher. This is probably the reason guys like Parker and Kyrie (net negative defenders) shouldn't have been ranked as high as they were. While guys like Towns (another two way big who checked all the boxes) reinforced his 78 rating. Last year: Simmons projected as a very good defender but wasn't as well-rounded offensively as AD. His production (19-12-5) was jaw-dropping but might have been empty based on how his team performed. In comparison...AD's 14-10 brought home a title. So it was close (i'd have given AD the edge 79-78) but you can see Stauff's reasoning (when you add 5apg to Simmons' stat line it makes it even more impressive) That he and AD did what they did as freshmen makes it even more WOW. Which brings us to this year: Fultz projects as an elite guard but was not a good defensive player in college..although his production 23-6-6 (as a freshman) was incredible. When you look at his splits and percentages on contested shots its even moreso, but he wasn't a 2 way player in college so IMO it automatically puts him lower than other high-production guys like AD and Simmons IMO. When you add in how bad Washington was its another chink in his armor. You'd never lower a guy's overall based on team record but it should be the determiner in comparisons with other guards. I'm a Sixer fan but i'm thinking 77 OVR. Ball? I can't even believe he's in this convo. I get that Lavar is the best hype-man since Rick Flair, but he doesn't rate anywhere close to Fultz and most experts agreed there was a pretty big gap between Fultz and the rest of the draft. I get that the draft was deep but that he's an 80 seems like a huge case of caught-up-in-the-hypeness.